Update: Full army lists from this event can be found here. The Cal Poly SLO Ironman was held on Saturday and hosted at the Super Winter Minicon at Cal Poly San Luis Obispo. 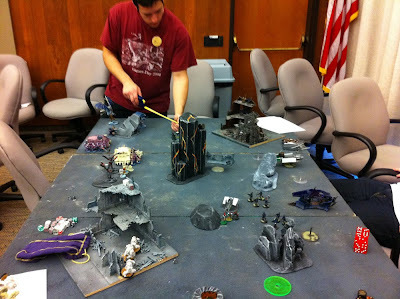 Special thanks to Alex Haag for organizing this 40k tournament and Game Theory ch2 for hosting the convention! A hearty congratulations to Reece Robbins for piloting his Eldar to victory in the Cal Poly San Luis Obispo Ironman tournament. Reece navigated a field of 13 players to a perfect 4-0 record. Reece is now the top rated player on the Sprue Posse circuit and his efforts won him a slot in our invitational in December! 1 Response to "Playing: The Cal Poly San Luis Obispo Ironman"
Thanks for posting this Kevin, and thanks to everyone who participated in the event.